For a number of years we have been working in partnership with Huddig on development, manufacture and delivery of electrical systems for their various machine series. Often, the electrical systems are actually unique to each machine. Huddig develops, manufactures and sells backhoe loaders for the electrical, railway and construction and civil engineering sectors. 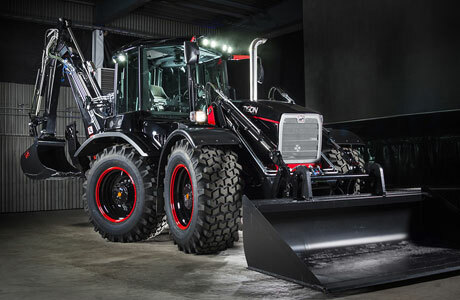 The company has long been the market leader in backhoe loaders in the Swedish market. The Huddig backhoe loader is known for its smart functions and innovative technology. When it was time to develop a new model of the Huddig D range, Rimaster Development was an obvious partner. 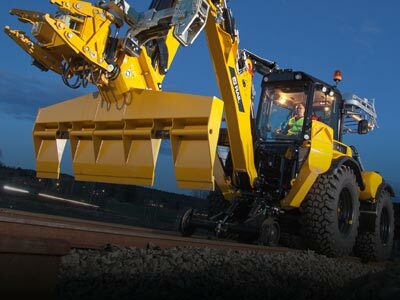 The D range is Huddig’s flagship – a powerful backhoe loader that can be tailored to meet customer needs in the segments cable work, railway and construction. The new model, launched in April, is based on a new environmentally-friendly Stage IV Final engine. – This results in lower particulate and nitrogen oxide emissions, but also more operating hours, says Fredrik Forsberg, development engineer at Huddig. The new model also has a new electrical and control system. The system has higher performance and more processing power, which makes the machine scalable. We’ll be able to add even more features and further customize each machine to meet the customer’s specific needs. Meanwhile, the driver’s cab has been given an even bigger and better screen and intuitive control. A good interface between man and machine is crucial. Rimaster Development has played a key role in its development. Rimaster has been responsible for the electrical system with schedules and cable drawings. Control systems and software have been developed by Huddig. – We have a relationship that goes far back and we know exactly where we have each other. This has resulted in a close dialog which is characterized by flexibility and simplicity. Rimaster is responsive to the solutions and components we are interested in, while keeping us updated on what’s happening on the market and coming with new proposals. – Our customers are very knowledgeable and interested in innovative technology. Huddig must always be in the forefront of development. Offering future-proof products that have high functionality and can develop over time is crucial. In this perspective, our cooperation with Rimaster is very valuable.